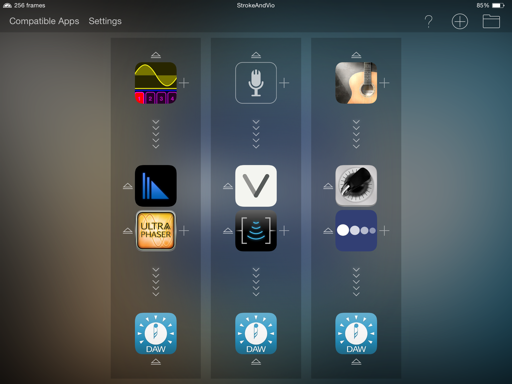 Share your Audiobus 2 presets here! @SpookyZoo - Just came back to check out your preset but now it's gone. @HoldernessMedia, in the first preset I was losing audio on SAMPLR for some reason. Thanks for your presets btw. That Multi pipe Loopy preset is great. Ahh ok. Yeah the Loopy preset is powerful once you've got your loops setup in appropriate tracks. Loopy save Audio loops like Sector in State Saving??? Re setting Loopy up as multiple inputs, it's a shame that you can't change the track which is assigned to an individual input AFTER the input has been set up, or choose multiple tracks for each input (setting them up individually adds time). Given that you have to add a new input to get to the assign track option (and Loopy is the only app that currently supports this on my list, so I have to scroll through each time! ), it would be nice to be able to long-press on the app icon in order to set/change the track assigned. I assume it isn't possible at this point, but I'd like to be able to sync presets across all my iOS devices. We hear you. The current state of state saving (heh ) is really just a humble start. Understood....a great start. Appreciate you considering it @Sebastian. I'm wondering if the loop is included in the saved state within Guitarism. I thought I would try and make my iPad cry. No go. This one's got Stroke Machine going through AD 480 and Ultra Phaser, vocal through Vio and AUFX Space for harmony, and Guitarism through JamUP and EchoPad. All going into MT Daw on separate tracks in realtime. I did a 3 minute recording with no hiccups. Absolutely awesome. I used an Apogee Mic for vocal input. Songwriter's dream. Had to switch to Stroke Machine to start the drums, start the recording in MT Daw with the AB 2 sidebar, then switch over to Guitarism to play the chords. Vio in G with Prairie Song, Stroke Machine 808 Kit and default pattern, Ultra Phaser with Extreme preset (these don't save presets yet). That's it I'm getting a Air ! Missing out on all this combo goodness! I thought I would try and make my iPad cry. No go. . .
WOW. That is damn impressive. Stroke Machine alone brings my iPad 4 to its knees fairly quickly. Hi guys here's my effort Funky Pigeon! You need to be a Bird Stepper beta tester to use! It's just a test to see if I can get 3 chains going on a ipad 3 hits about 85 percent CPU load so not bad. Thanks for those, you managed to create at least a new instrument with the Sector/Swoopster preset, at least in my mind. One of the awesome parts of this is getting great presets for your apps too! No presets to share yet but howzabout some preset link formatting? Sorry it's a bit of a mess—I built it in Firebug, not vim. Would be more fun to pull the XML data like the actual preset site so we could include the app names within the forum post but cross domain XML isn't possible via AJAX request. You could setup a PHP proxy on the forum's domain though. AB2 presets are awesome and since this forum is going to be the defacto way of sharing them for a lot of us, I reckon they orta look nice. They could certainly look nicer than I've done but it's a start. Yup, Sector through Swoopster is a devastating combo, I love it. This is going to be serious fun Some really inventive presets floating around! @funjunkie27 guitarism doesn't save the loop since I don't really consider the loop as a part of guitarism's "state". Similarly, guitarism's internal presets don't store the loop either. But it'd be pretty easy to add (to the internal presets as well as AB presets). Are people using guitarism like this much, letting the loop run while doing something live on other apps? Thanks for passing that on @Rhism. I usually just use the loop function to dial in downstream effects, but having it as a complement to live performance seems like a good fit. A simple preset here, but I'm posting it, along with a Soundcloud link, to illustrate what I think could be possible with full state savings and presets. Unless custom samples are used, I would think state saving could re-create exactly what is heard in the Soundcloud link with this app combination. At that point, it could be tweaked as desired. This is going to be a great forum for educating each other. Sharing presets is far more than just showing how we string apps together - what I am learning is how apps are used for great effect - far better than any manual can teach. I've posted a few presets on my twitter feed if you're interested. A few more people have done the same. Do a #abpreset search. Here's my first shared preset: Audiobus preset 'BebotBack BebotBack': http://preset.audiob.us/O2hOuf94W8G3d8g Bebot sounds great through Vio btw. This AB2 update is solid. Looking forward to all the state saving app updates in the future.